By the mid 20th century humans had achieved a level of technological mastery sufficient to leave the surface of the planet for the first time and explore space. Technology is a word with origins in the Greek word technologia (τεχνολογία), techne (τέχνη) "craft" and logia (λογία) "saying." It is a broad term dealing with the use and knowledge of humanity's tools and crafts. Science is the formal process of investigating natural phenomena. It produces information and knowledge about the world. Engineering is the goal-oriented process of designing and building tools and systems to exploit natural phenomena for a practical human means. 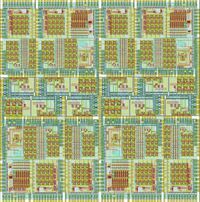 Engineers work within the constraints of natural laws and societal needs to create technology. Technology is the consequence of these two processes and societal requests. Most commonly, the term technology is used as the name of all engineering products. For scientists and engineers, technologies are: conceptual tools - as methods, methodologies, techniques; instruments - as machines, aparatus, software programs; as well as, different artificial materials which they normally use. Technologies are not direct products of science, because they have to satisfy such requirements as: utility, usability and safety, therefore the application of the scientific knowledge to concrete purposes requires the contribution of engineering research. Until recently, it was believed that the development of technology was a concept akin and restricted only to human beings, but recent studies show that other primates (such as chimpanzees), and certain dolphin communities, have developed simple tools and learned to pass this knowledge to other generations, what would constitute a form of non-human technological development. The history of technology is at least as old as humanity. Some primitive forms of tools have been discovered with almost every find of ancient human remains dating from the time of homo habilis). Nevertheless, other animals have been found to use tools—and to learned to use and refine tools—so it is incorrect to distinguish humans as the only tool-using or tool-making animal. The history of technology follows a progression from simple tools and simple (mostly human) energy sources to complex high-technology tools and energy sources. The earliest technologies converted readily occurring natural resources (such as rock, wood and other vegetation, bone and other animal byproducts) into simple tools. Processes such as carving, chipping, scraping, weaving, knotting, rolling (the wheel), and sun-baking are simple means for the conversion of raw materials into usable products. Anthropologists have uncovered many early human habitations and tools made from natural resources. Birds and other animals often build elaborate nests and some simple tools out of various materials. We normally don't consider them to be performing a technological feat, primarily because such behaviour is largely instinctive. There is some evidence of occasional cultural transferrence, especially among the other, nonhuman primates. Nevertheless, there is now considerable evidence of such simple technology among animals other than humans. The use, and then mastery, of fire (circa 1,000,000 - 500,000 BC ) was a turning point in the technological evolution of humankind, affording a simple energy source with many profound uses. Perhaps the first use of fire beyond providing heat was the preparation of food. This enabled a significant increase in the vegetable and animal sources of food, while greatly reducing perishability. The use of fire extended the capability for the treatment of natural resources and allowed the use of natural resources that require heat to be useful. (The oldest projectile found is a wooden spear with fire hardened point, circa 250,000 BC.) Wood and charcoal were among the first known materials used as a fuel. Wood, clay, and rock (such as limestone), were among the earliest materials shaped or treated by fire, for making artifacts such as weapons, pottery, bricks, and cement. Continuing improvements led to the furnace and bellows and provided the ability to smelt and forge native metals (naturally occurring in relatively pure form). Gold, copper, silver, and lead, were such early metals. The advantages of copper tools over stone, bone, and wooden tools were quickly apparent to early humans, and native copper was probably used from near the beginning of Neolithic times (about 8000 BCE). Native copper does not naturally occur in large amounts, but copper ores are quite common and some of them produce metal easily when burned in wood or charcoal fires. The wheel was invented circa 4000 BCE. Eventually, the working of metals led to the discovery of alloys such as bronze and brass (about 4000 BCE). The first uses of iron alloys such as steel dates to around 1400 BCE. Meanwhile, humans were learning to harness other forms of energy. The earliest known use of wind power is the sailboat. The earliest record of a ship under sail is shown on an Egyptian pot dating back to 3200 BCE. From prehistoric times, Egyptians probably used "the power of the Nile" annual floods to irrigate their lands, gradually learning to regulate much of it through purposely built irrigation channels and 'catch' basins. Similarly, the early peoples of Mesopotamia, the Sumerians, learned to use the Tigris and Euphrates rivers for much the same purposes. But more extensive use of wind and water (and even human) power required another invention. According to archaeologists, the wheel was invented about 4000 B.C. The wheel was likely independently invented in Mesopotamia (in present-day Iraq) as well. Estimates on when this may have occurred range from 5500 to 3000 B.C., with most experts putting it closer to 4000 B.C. The oldest artifacts with drawings that depict wheeled carts date from about 3000 B.C. ; however, the wheel may have been in use for millennia before these drawings were made. There is also evidence from the same period of time that wheels were used for the production of pottery. (Note that the original potter's wheel was probably not a wheel, but rather an irregularly shaped slab of flat wood with a small hollowed or pierced area near the centre and mounted on a peg driven into the earth. It would have been rotated by repeated tugs by the potter or his assistant.) More recently, the oldest-known wooden wheel in the world was found in the Ljubljana marshes of Slovenia. 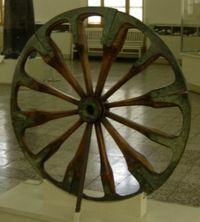 The invention of the wheel revolutionized activities as disparate as transportation, war, and the production of pottery (for which it may have been first used). It didn't take long to discover that wheeled wagons could be used to carry heavy loads and fast (rotary) potters' wheels enabled early mass production of pottery. But it was the use of the wheel as a transformer of energy (through water wheels, windmills, and even treadmills) that revolutionized the application of nonhuman power sources. 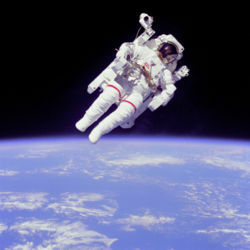 Tools include both simple machines (such as the lever, the screw, and the pulley), and more complex machines (such as the clock, the engine, the electric generator and the electric motor, the computer, radio, and the Space Station, among many others). As tools increase in complexity, so does the type of knowledge needed to support them. Complex modern machines require libraries of written technical manuals of collected information that has continually increased and improved -— their designers, builders, maintainers, and users often require the mastery of decades of sophisticated general and specific training. Moreover, these tools have become so complex that a comprehensive infrastructure of technical knowledge-based lesser tools, processes and practices (complex tools in themselves) exist to support them, including engineering, medicine, and computer science. Complex manufacturing and construction techniques and organizations are needed to construct and maintain them. Entire industries have arisen to support and develop succeeding generations of increasingly more complex tools. Electronics have grown ever smaller and more sophisticated. Components have progressed from vacuum tubes, through transistors, to integrated circuits. 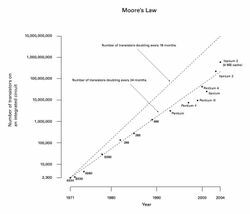 Moore's law is about the empirical observation, that at our rate of technological development, the complexity of an integrated circuit, with respect to minimum component cost, will double approximately every 18 months. It is attributed to Gordon E. Moore, a co-founder of Intel. However, Moore had heard Douglas Engelbart's similar observation possibly in 1965. Engelbart, a co- inventor of today's mechanical computer mouse, believed that the ongoing improvement of integrated circuits would eventually make interactive computing feasible. The influence of computers has been pervasive in the workplace, radically changing the way people access and buy goods and services, process accounts, store information and communicate with others. The personal computer has enabled these activities to be commonplace in the home, and electronic technologies have allowed people to receive news and entertainment from all over the world into their homes. Economics can be said to have arrived on the scene when the occasional, spontaneous exchange of goods and services began to occur on a less occasional, less spontaneous basis. 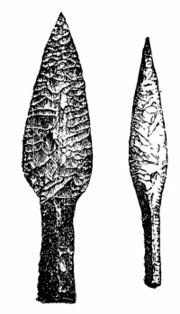 It probably didn't take long for the maker of arrowheads to realize that he could probably do a lot better by concentrating on the making of arrowheads and barter for his other needs. Clearly, regardless of the goods and services bartered, some amount of technology was involved—if no more than in the making of shell and bead jewelry. Even the shaman's potions and sacred objects can be said to have involved some technology. So, from the very beginnings, technology can be said to have spurred the development of more elaborate economies. In the modern world, superior technologies, resources, geography, and history give rise to robust economies; and in a well-functioning, robust economy, economic excess naturally flows into greater use of technology. Moreover, because technology is such an inseparable part of human society, especially in its economic aspects, funding sources for (new) technological endeavors are virtually illimitable. However, while in the beginning, technological investment involved little more than the time, efforts, and skills of one or a few men, today, such investment may involve the collective labor and skills of many millions. Consequently, the sources of funding for large technological efforts have dramatically narrowed, since few have ready access to the collective labor of a whole society, or even a large part. It is conventional to divide up funding sources into governmental (involving whole, or nearly whole, social enterprises) and private (involving more limited, but generally more sharply focused) business or individual enterprises. The government is a major contributor to the development of new technology in many ways. In the United States alone, many government agencies specifically invest billions of dollars in new technology. Technology has frequently been driven by the military, with many modern applications being developed for the military before being adapted for civilian use. However, this has always been a two-way flow, with industry often taking the lead in developing and adopting a technology which is only later adopted by the military. Entire government agencies are specifically dedicated to research, such as America's National Science Foundation, the United Kingdom's scientific research institutes, America's Small Business Innovative Research effort. Many other government agencies dedicate a major portion of their budget to research and development. Research and development is one of the biggest areas of investments made by corporations toward new and innovative technology. Many foundations and other nonprofit organizations contribute to the development of technology. In the OECD, about two-thirds of research and development in scientific and technical fields is carried out by industry, and 20 percent and 10 percent respectively by universities and government. But in poorer countries such as Portugal and Mexico the industry contribution is significantly less. The U.S. government spends more than other countries on military research and development, although the proportion has fallen from about 30 percent in the 1980s to less than 20 percent. Intermediate technology, more of an economics concern, refers to compromises between central and expensive technologies of developed nations and those which developing nations find most effective to deploy given an excess of labour and scarcity of cash. In general, a so-called "appropriate" technology will also be "intermediate". Persuasion technology: In economics, definitions or assumptions of progress or growth are often related to one or more assumptions about technology's economic influence. Challenging prevailing assumptions about technology and its usefulness has led to alternative ideas like uneconomic growth or measuring well-being. These, and economics itself, can often be described as technologies, specifically, as persuasion technology. Public schools have attempted to introduce varied concepts of technology on the junior high level to better prepare youngsters for subsequent schooling, as well as entrance into the workforce. The use of technology has a great many effects; these may be separated into intended effects and unintended effects. Unintended effects are usually also unanticipated, and often unknown before the arrival of a new technology. Nevertheless, they are often as important as the intended effect. The most subtle side effects of technology are often sociological. They are subtle because the side effects may go unnoticed unless carefully observed and studied. These may involve gradually occurring changes in the behaviour of individuals, groups, institutions, and even entire societies. Mechanistic world view: Viewing the universe as a collection of parts, (like a machine), that can be individually analyzed and understood (McGinn). This is a form of reductionism that is rare nowadays. However, the "neo-mechanistic world view" holds that nothing in the universe cannot be understood by the human intellect. Also, while all things are greater than the sum of their parts (e.g., even if we consider nothing more than the information involved in their combination), in principle, even this excess must eventually be understood by human intelligence. That is, no divine or vital principle or essence is involved. Social progress: The belief that there is such a thing as social progress, and that, in the main, it is beneficent. Before the Industrial Revolution, and the subsequent explosion of technology, almost all societies believed in a cyclical theory of social movement and, indeed, of all history and the universe. This was, obviously, based on the cyclicity of the seasons, and an agricultural economy's and society's strong ties to that cyclicity. Since much of the world (i.e., everyone but the hyperindustrialized West) is closer to their agricultural roots, they are still much more amenable to cyclicity than progress in history. This may be seen, for example, in Prabhat rainjan sarkar's modern social cycles theory. For a more westernized version of social cyclicity, see Generations : The History of America's Future, 1584 to 2069 (Paperback) by Neil Howe and William Strauss; Harper Perennial; Reprint edition (September 30, 1992); ISBN 0688119123, and subsequent books by these authors. Creates an aggregation of effects. Changes the distribution of justice. But the most important contribution of technology is making life of common people much easier and helping them achieve what was previously not possible. Technology, throughout history, has allowed people to complete more tasks in less time and with less human intellectual or manual labour. Many herald this as a way of making life easier. However, work has continued to be proportional to the amount of energy expended, rather than the quantitiative amount of information or material processed. Technology has had profound effects on lifestyle throughout human history, and as the rate of progress increases, society must deal with both the good and bad implications. In many ways, technology simplifies life. In other ways, technology complicates life. Sweatshops and harsher forms of slavery are more likely to be found in technologically advanced societies, relative to primitive societies. The increasing oppression of technologically advanced societies over those which are not. More people are starving now, in this most technologically advanced age, than at any point in history or pre-history. 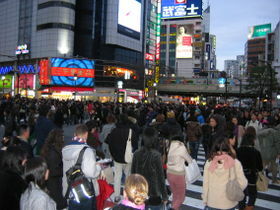 The increase in transportation technology has brought congestion in some areas. New forms of danger existing as a consequence of new forms of technology, new types of nuclear reactors, unforeseen genetic mutations as the result of genetic engineering, or perhaps something more subtle which destroys the ozone or warms the planet. New forms of entertainment, such as video games and internet access could have possible social effects on areas such as academic performance. Creates new diseases and disorders such as obesity, laziness and a loss of personality. The rise of very large organizations: e.g., governments, the military, health and social welfare institutions, supranational corporations. The almost instantaneous dispersal of information (especially news) and entertainment around the world. Most modern technological processes produce unwanted byproducts in addition to the desired products, which is known as industrial waste and pollution. While most material waste is re-used in the industrial process, many forms are released into the environment, with negative environmental side effects, such as pollution and lack of sustainability. Different social and political systems establish different balances between the value they place on additional goods versus the disvalues of waste products and pollution. Some technologies are designed specifically with the environment in mind, but most are designed first for economic or ergonomic effects. Historically, the value of a clean environment and more efficient productive processes has been the result of an increase in the wealth of society, because once people are able to provide for their basic needs, they are able to focus on less-tangible goods such as clean air and water. Each wave of technology creates a set of waste previously unknown by humans: toxic waste, radioactive waste, electronic waste. Jacques Ellul is one proponent of the irresistibleness of technology to humans. He espouses the idea that humanity cannot resist the temptation of expanding our knowledge and our technological abilities. However, he does not believe that this seeming autonomy of technology is inherent. But the perceived autonomy is due to the fact that humans do not adequately consider the responsibility that is inherent in technological processes. Another proponent of these ideas is Langdon Winner who believes that technological evolution is essentially beyond the control of individuals or society. Individuals rely on governmental assistance to control the side effects and negative consequences of technology. Supposed independence of government. An assumption commonly made about the government is that their governance role is neutral or independent. However some argue that governing is a political process, so government will be influenced by political winds of influence. In addition, because government provides much of the funding for technological research and development, it has a vested interest in certain outcomes. Others point out that the world's biggest ecological disasters, such as the Aral Sea, Chernobyl, and Lake Karachay have been caused by government projects, which are not accountable to consumers, so governments should stay out of industry entirely. Liability. One means for controlling technology is to place responsibility for the harm with the agent causing the harm. Government can allow more or less legal liability to fall to the organizations or individuals responsible for damages. Legislation. A source of controversy is the role of industry versus that of government in maintaining a clean environment. 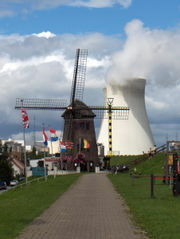 While it is generally agreed that industry needs to be held responsible when pollution harms other people, there is disagreement over whether this should be prevented by legislation or civil courts, and whether ecological systems as such should be protected from harm by governments. the economic values we place on the environment, individual wealth, government control, capitalism, etc.